I knew that I loved many of his painting of places I know, I knew that he was there at the beginning of the Newlyn School, and that he taught art and founded an art gallery there; but it was only when I walked around this exhibition that I realised that there were so very many paintings and that his talent was so broad. I also learned a little more about the man that gave me a greater understanding of the arc of his life and his work. I don’t really speak the language of art – and I probably never will – but I’d love to show you some of the paintings and share a few thoughts and memories. This painting, opposite the entrance door, was wonderfully well chosen. It fitted the space perfectly, it was clearly close to home and yet familiar, and it would have pulled me in had I not realised that this was a must- see exhibition. Not far away was a portrait that I didn’t know – and it was love at first sight. 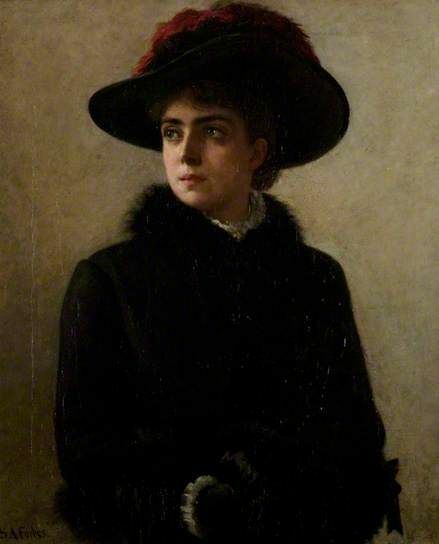 I couldn’t help thinking that it would have made a lovely cover for a green Virago Modern Classic, and I wondered if this was the Florence who gave her name to Florence Place, close to Newlyn Bridge. I have to say that the curators of this exhibition have done very well, gathering together works from this museum’s own collection with works from other galleries and from private collections. My first thought was – I know that road! It runs behind the granite quarry where my father, my grandfather and my great-grandfather worked. 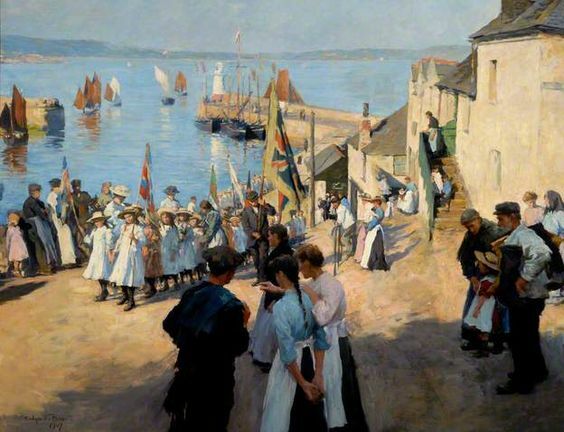 Newlyn is best known for painting and fishing, but it was also a quarry town. Travel around the harbour and up the hill towards Mousehole and you will come to Penlee Quarry. I remember when I was a little girl my father used to take me down the hill from my grandparents house to see the industrial narrow gauge railway that took stone down from the quarry to the quay, where it was loaded onto stone boats that would sail across the bay …. One of the things that I noted down to say about this exhibition was that it was lovely to see so many contrasts. In the first room there were many big paintings – and a few very small ones. This is my favourite small painting. It’s our promenade and that dog is so like Briar! 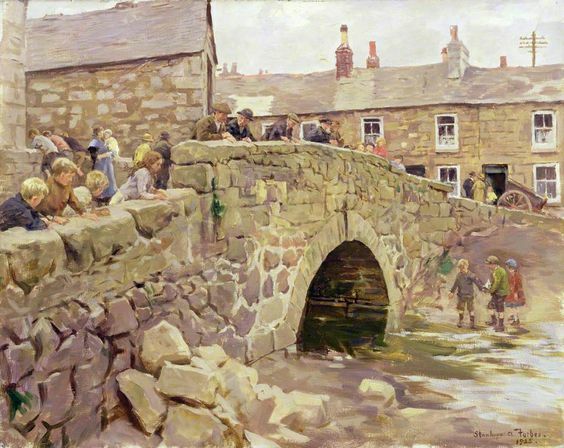 The promenade has changed somewhat over the years, but when I saw this painting of Newlyn Bridge I realised that it has hardly changed at all. The Man of the House remembers playing down there with his cousins, and, more recently, we’ve walked up the stream with Briar at low tide. Here’s another lovely painting of a bridge a few miles away. The other contrast I saw was between different kinds of light. When we crossed the corridor to the next rooms we saw that paintings had been arranged to move from the light outside to dark interiors and then back outside again. I hadn’t known that Forbes was widowed in 1912 and that he lost his only son a few years later. 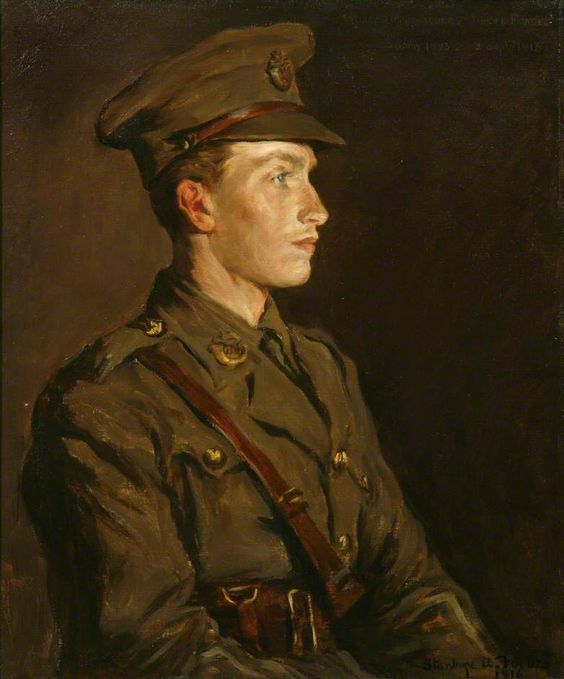 That made this portrait of his son, painted after his death, particularly poignant. 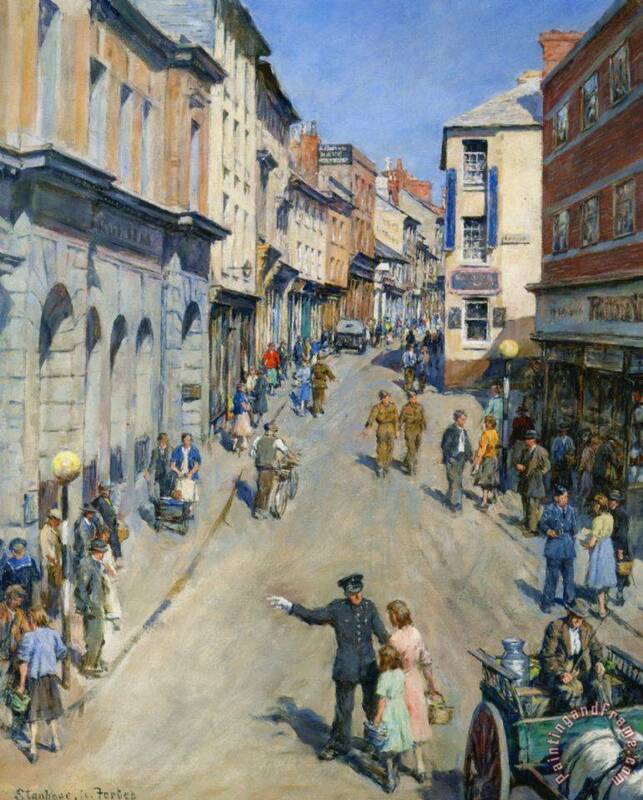 Years later, during World War II, Forbes painted the main street of my home town. I have always loved this painting, but I hadn’t notice that it included representatives of all three armed services. Another thing I should say is that this isn’t purely a Cornish exhibition, and there are paintings of other people and places; but I had to pick out the paintings of places I knew and loved. The painting that I particularly wanted the Man of the House to see was upstairs. His father had been a train driver during the last days of steam, and it had occurred to me that this is the station as he would have known it as a boy, when his ambition to drive trains was forming. 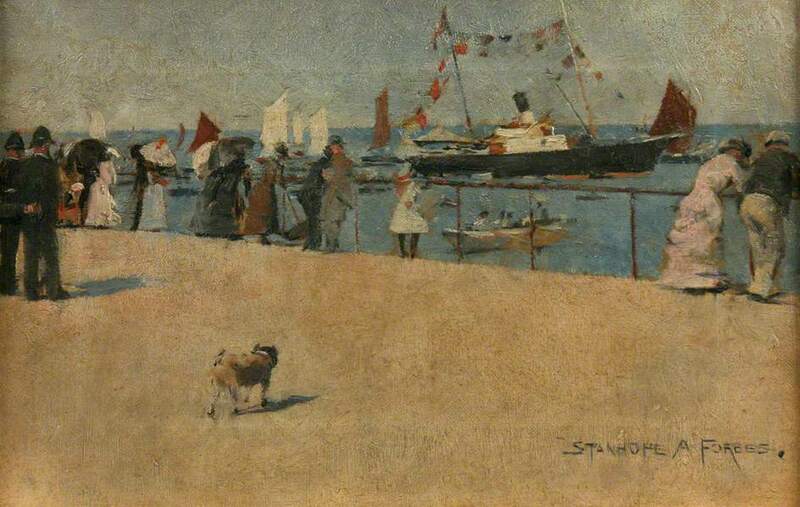 That was the last painting we saw, but, as we haven’t seen the sea yet I really must show you just one more. 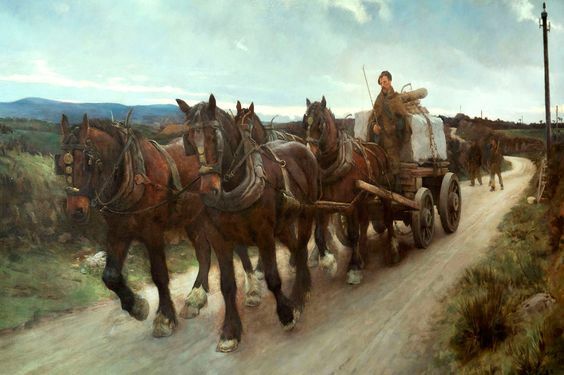 Stanhope Forbes: Father of the Newlyn School runs until 9th September 2017. Do visit if you have the chance. 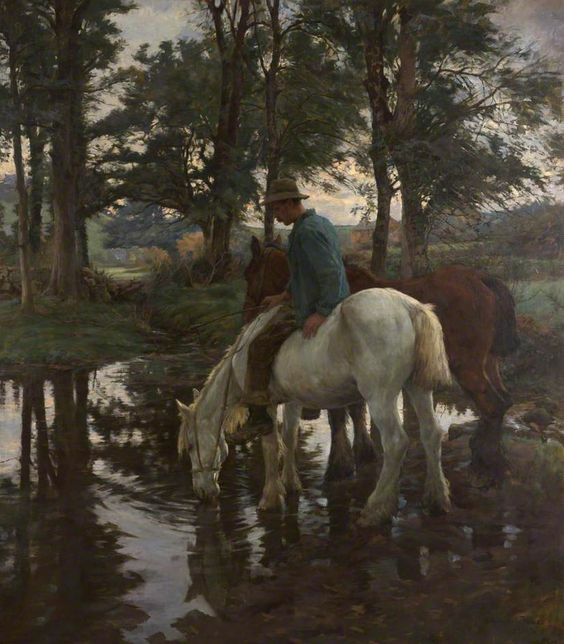 There are so many more wonderful paintings to see, and art is so much lovelier, so much more alive, face to face than it can ever be in a book or on a computer screen. I’m so glad you think so too – I might have to put together a collection of ‘it ought to be a cover – or even ‘what books cover should it be’ – paintings one day. I’m glad you liked them – it’s lovely to be able to share them this way. Jane, I love them all! Thank you so much for taking us to the art gallery with you. You’ve introduced me to a new artist. Stunning pictures Jane and thank you so much for sharing – I particularly love the last one of the Gala Day. I’m glad you liked them. I’m particularly fond of Gala Day because its a view I know well, and it captures the bay where I live (on the other side) absolutely perfectly. How lovely to see these Jane. Thank you so much. 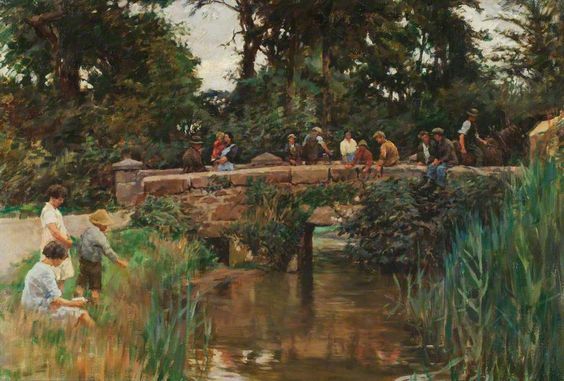 My uncle appears in some of Stanhope Forbes paintings because my father remembers him coming to their house to ask my grandmother if her son would be allowed to sit for him. Very poignant because I never knew my uncle as he died at the age of twelve. When the paintings were done he would have been about six or seven years old. 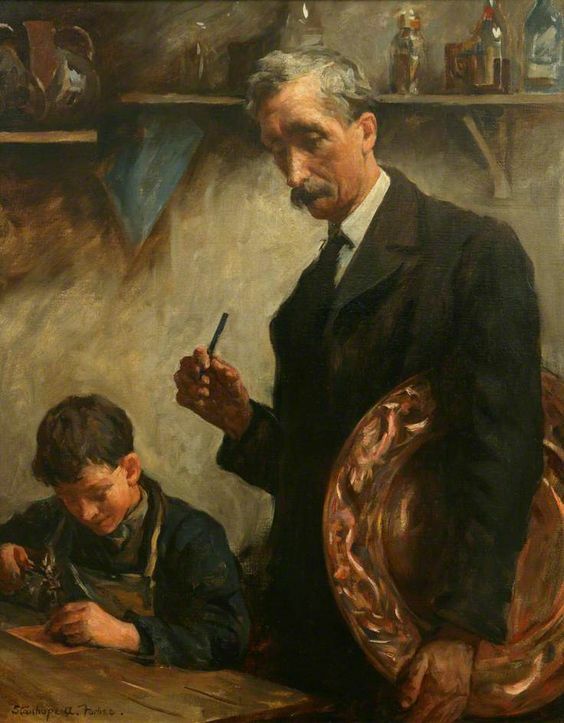 I was so impressed when my father told me but he said his brother wasn’t at all pleased to be painted as he had to sit still and for a lad of his age that was not what he wanted to be doing! How good you are at bringing lovely memories flooding back. How lovely to have that association with such wonderful paintings, though I’m sorry your uncle didn’t grow up to appreciate that all that sitting around might have been worth it. We are very lucky to have had the Newlyn School to capture their time and places we know so very well. I am absolutely in love with those paintings. They look how I remember Penzance, probably as I’ve not been there since I was 8, and all my Cornish holiday nostalgia is sunny is brightly coloured. Plus it was the mid-eighties, everything seemed more brightly coloured back then 🙂 Lovely post! I’ve either lived here or visited regularly all my life, and I love the way these paintings capture places I know so well. And it’s lovely to see Newlyn Bridge and the slipway going down to the quay without the cars that are inevitable parked there these days. 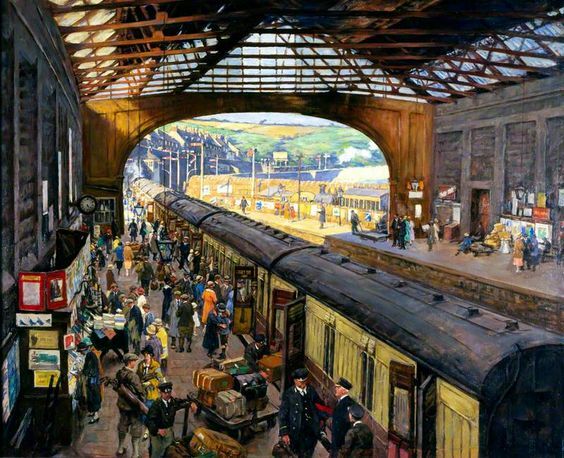 What beautiful paintings – I love the station and that fabulous ceiling, and Gala Day. And how nice that you’ve enabled those of us who live further north to enjoy this exhibition from a distance. Gorgeous Jane, thanks for sharing. I love his use of light. 😍😍😍 Thanks so much for sharing these wonderful images – it has made my day! Thank you so much for sharing these pictures and describing your way around the exhibition – as usual, we’re going to miss this as coming down next at the very end of September, so it’s wonderful to have seen so much of it “with” you, here! What wonderful paintings! I am especially drawn to the bright ones, with people and sea. You are right – it’s so much more rewarding to see the picture live, to stand in front of it as opposed to seeing it on the screen or in a catalog, a book… One of the reasons I want to go back to Gothenburg, for example, would be to see Albert Edelfelts “At Sea” again. Stunning! All of these are gorgeous. Truly exceptional.